OH! Chart 190319 | TXT Wins the Crown! OH! 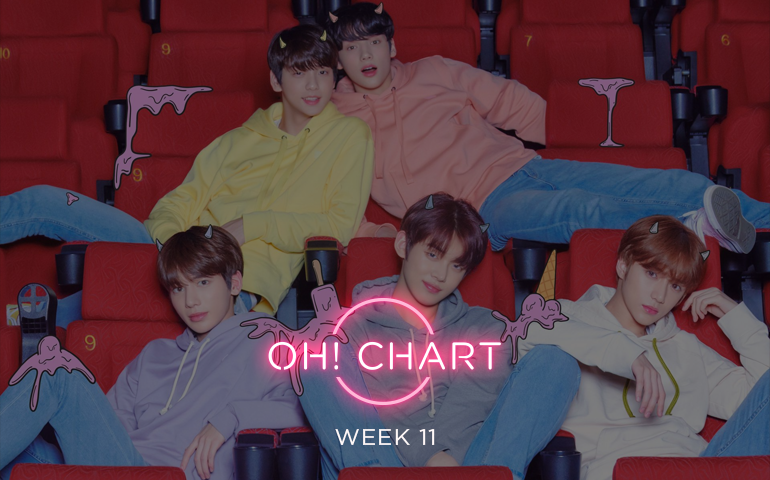 Chart gets some fresh new faces this week with TXT joining the rankings! The chart is divided into three different categories: Gaon Digital Score (60%), Hanteo Physical Sales (15%), and OH User Voting (25%). For each weekly cycle of the chart, OH users can vote for more than one nominee. However, they cannot vote for the same nominee more than once. Chart Masters will then gather the data and crunch the numbers. Once an artist achieves three wins with one song (a triple crown! ), this song will be excluded from future charts. N.Flying keeps winning over k-nets with their song Rooftop scoring 53,853,397 points. ITZY stays consistent with their song Dalla Dalla coming in second place with 42,186,027 digital points. Third place this week is a new entry to OH! Chart with Kassy‘s The Day Was Beautiful scoring 41,964,246. BTS‘ little brother group TXT doesn’t let their Bighit family down, coming in first for physicals this week with 75,763 copies of their debut album The Dream Chapter: Star. Second place goes to GOT7‘s duo subunit JUS2, selling 57,482 copies of their mini album FOCUS. Third place, selling 23,207 copies of his debut album My Moment is little cloud Ha Sungwoon. TXT comes in first place for votes this week either solidifying their fandom or maybe getting some help from their big brothers, either way the tally was 38 votes. Sunmi represented the gays and showed out with 31 votes, landing her in second place. And finally, in a first for OH! Chart this year, MAMAMOO‘s Hwasa and ITZY tied for third place with 20 votes each. Overall, TXT comes out on top with 14.28 thanks to their massive physical points and voting public. Second place goes to ITZY with 10.22 in part to k-nets loving their song. And finally N.Flying rounds out the top three continuing their digital success with 10.18. TXT or Tomorrow X Together is Bighit’s latest new boy group! These fresh faces have jumped on the scene following in some big footsteps. Their new song Crown is a bright an energetic introduction to the group’s sound. Filled with electronic elements and synth brass sounds, they blend vocals, rap and dancing to showcase their talents. Will they hit it big with the public and gain a huge fandom or are you just jamming out? Let us know your thoughts below!